Mrs. Frieda Chmela arrived to St. James Rehabilitation and Healthcare Center on November 27, 2017 from an inpatient hospitalization at Good Samaritan Hospital in West Islip, New York. Originally, Mrs. Chmela was taken to another local rehabilitation were she was not happy. Considering she already had family at St. James, She knew that it was going to be exceptional care here. Mrs. Chmela came to St. James with a broken knee. Unfortunately, she knew she was going to have to work twice as hard to heal due to the fact that she was not able to undergo surgery. After her visit from her specialist she was advised to participate in an extensive inpatient rehabilitation to support her range of motion and ability to ambulate once returning home. Her daughter-in-law, Teresa, has had her mother with St. James Rehabilitation for several months and knew she had to do what it took to get her mother-in- law in a great healthcare community. Mrs. Chmela was warmly greeted by multiple professionals of Team St. James whom anticipated her arrival. Within the first 24 hours, she was greeted by clinicians, therapists, physicians, administrative staff and many other valued members of the team to welcome her and answer any questions that she or her family may have had. 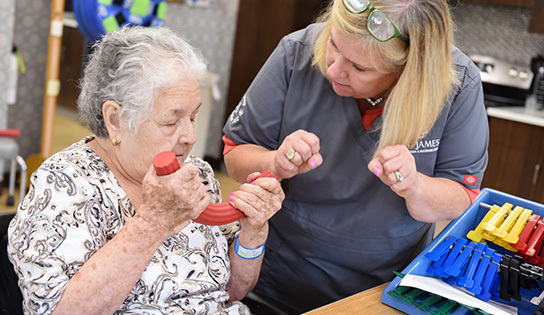 Her physical and occupational therapist April and Linda, began her therapy program at bedside to evaluate her current state of health and mobility in conjunction with her most recent therapy/clinical notes from Good Samaritan Hospital. She arrived as a slight assist with a visual transfer to her bed. came to St. James I did not want to be here or any other Rehabilitation. On December 29, 2017, Mrs. Chmela was discharged home to celebrate the New Year with an eager return to her family. Upon Discharge, her ambulation increased from 100 feet to 200 feet and was able to transfer independently, without any supervision. Team St. James is thrilled for Frieda and the incredible strides she achieved while under our care. We wish her nothing but the best and a happy and healthy New Year!